Gunshots suddenly rent the air, muting the more familiar sounds of chirping birds on rooftops, their wiry claws scraping gratingly across rusty surfaces of rows of tin shanties that make up the expansive Dandora slum. The repetitive clap of bullets violently exiting heated gun muzzles like intermittent thunder-strikes was loud enough to get Samuel Musili Mwenda, 21, out of bed. Leaving his bed at 6.30am on a Sunday was not his plan, but curiosity would force him to climb out of its comfort and up a tree just so he could have a clearer view of what was happening outside. But less than 10 minutes later, a female police officer would force him down the tree, point a gun at him and shoot him once in the chest and then in the head. He died sprawled in the dirt outside the tin shack he once called home. What Samuel will never know is that, as he lay bleeding in the dust, a family of three had also been shot alongside a gangster on the run, who, after climbing their roof to escape from the police, became their uninvited guest when the rusty iron sheet caved in, bringing a hail of bullets that eliminated the fugitive and his 'host'. Police reports to the media indicated that all six were armed gangsters who had stolen a motorcycle registration number KMEL 650F from a boda boda rider and gang-raped his pillion passenger in Lucky Summer at 2.30am. Buruburu divisional police boss Geoffrey Maiyek would later tell the media that the operator contacted the owner of the motorcycle, who then linked up the police with the tracking company. "The police officers traced the motorcycle to Gitwamba in Dandora. They encountered the suspected gangsters and a shoot-out ensued," he said. He claimed that the two victims -- the boda boda rider and the raped woman -- had positively identified the six suspects and that, after police had shot them, three home-made pistols capable of firing together with rounds of ammunition were recovered from the dead men. 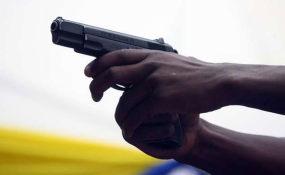 However, witnesses said police ambushed two people on the stolen motorbike at Kifarage, Dandora Phase 4, but the gangsters sped away when ordered to stop. "When they did not stop, the police officers shot one of them, the one who was on the pillion. The other suspect, who was riding the motorcycle, rode into a corner and then abandoned the motorcycle and ran away," a witness, Mr Peter Irungu said. He said the suspect climbed up the roof of a house in a bid to escape, but it caved in. The officers then descended on the house and ordered everyone out, witnesses said. They found three other occupants, who had been preparing to go to church: David Kariuki Maina, 38, and his nephews Peter Mwangi, 29, and John Kamau, 21. Peter, according to David's wife Joyce Wanjiru, was a student at Kisii University, while his younger brother, John, was set to start his KCSE exams on Monday at Murang'a Secondary School. He was to travel back to Murang'a later that day. "Their mother died three months ago and, since they were students, they have been staying with us whenever the schools close. Peter had come to ask for school fees because his school wanted arrears cleared before the start of exams," Ms Wanjiru said. On the day of the shooting, she said, she had gone away with her two children and was planning to go to her husband's house later that day. Josephine Kathini, who is the grandmother of Samuel Musili Mwendwa, said her grandson too was planning to sit for his KCSE examinations at Dandora Secondary School. "His mother died two years ago and, since then, I have been taking care of him and his sister. He was not a criminal. He did not have a gun contrary to what the police are saying," she said. Residents identified the female police officer responsible for the shootings that morning as a constable at Kinyago Police Post. "She started by shooting the suspect at David's house and when David and his nephews tried to explain how the suspect found his way into their house, she also shot them. The whole team of officers and a crowd that gathered because of the commotion moved to the tree where Samuel was. They forced him down before the female officer shot him in the chest. When he tried to escape, she shot him in the head, a Dandora Community Centre official said. Human rights organisations and the Independent Policing Oversight Authority (Ipoa), yesterday spent the better part of the day interrogating the families and their neighbours. In a statement to the media, Ipoa said it was looking into the matter. It said that it had "launched independent investigations into the incidents with a view of unravelling the circumstances that led to the fatal shootings and, more particularly, whether the police officers were justified in the use of their firearms." Ipoa head of communications, Mr Dennis Oketch said that if found culpable, the responsible officers would face the full force of the law. The International Justice Mission praised Ipoa for investigating deaths of 18 people through police action in separate incidents, including the latest cases.